I gave copies of Mastering the Art of French Cooking-Vol. I & II to my children for Christmas. 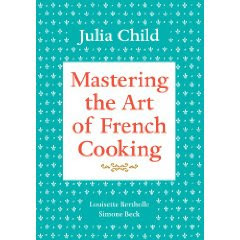 I also got a copy for myself and the plan is for us to share what works and doesn't work from this cooking classic by Julia Child. I saw the movie Julie and Julia this summer that is based on someone trying to cook through the book and recording her attempts. So this is similar but I want it to be lots of fun. It wasn't so much fun for the girl in the movie. I had heard that Julia Child's most famous recipe is boeufbourguinon so I decided to start there. The English title is Beef Stew in Red Wine with Bacon, Onions and Mushrooms. Child describes it as "one of the most delicious beef dishes concocted by man." I would have to agree. It has an intense flavor. I decided to make my plum pudding this week. It took several calls to my mother to ask specifics about the recipe. The recipe came from my Grandma (Ma) Erickson and she wasn't always very exact on her recipes. For example, the ingredients called for 'small cups' of some things, big teaspoons of soda, and enough flour to make it stiff. My mother shared some directions that weren't in the recipe which I am sure were necessary for success. The first step was to cut up the suet. My mother said she always has the butcher grind it when she buys it, so I will have to remember that for next year. The suet is important because it is the fat or oil in the pudding. The recipe calls for regular raisins and seeded raisins. We can't find seeded raisins anymore so my mom suggested dates as a substitute. That works well. The dry ingredients look like this when mixed together. This is the current view from our balcony (11 AM). It is very cold and windy with snow falling and blowing sideways. But the blizzard of 2009 appears to be a failure as a blizzard and is just a Michigan winter storm. it has resulted in 2 snow days for most of us though. Tom was down in Berrien Springs working as a book buyer at Andrews University for the end of semester buy-back. He came home early because business was so slow and I'm sure the weather impacted the buy-back. I've been home with 2 snow days and snow days still fun even though I don't work everyday. Yesterday my sister Kathy spent the day here and we did lots of interesting things. I was showing her things on the computer such as how to blog, how to download to iTunes, and burn cd's etc. As with everything on the computer, things don't go easily. But we got through it. I know I haven't been nearly as faithful writing this blog this fall. I miss sharing and even thinking about what I should share with my blogging friends. My positions at Hopkins Middle School & MAISA (Michigan Association of Intermediate School Administrators) have kept me working almost full-time with only an occasional day off. This week I was in Lansing Monday - Wednesday attending two different conferences. Both dealt with using data from student work to improve the teaching. The emphasis in education is changing from the focus on the teaching to a focus on what the students are learning. It is a subtle difference but it makes huge differences in the end product-the achievement of the students. Then Thursday and Friday I was at Hopkins Middle School working with teachers to implement strategies to help students better understand and remember what they read.